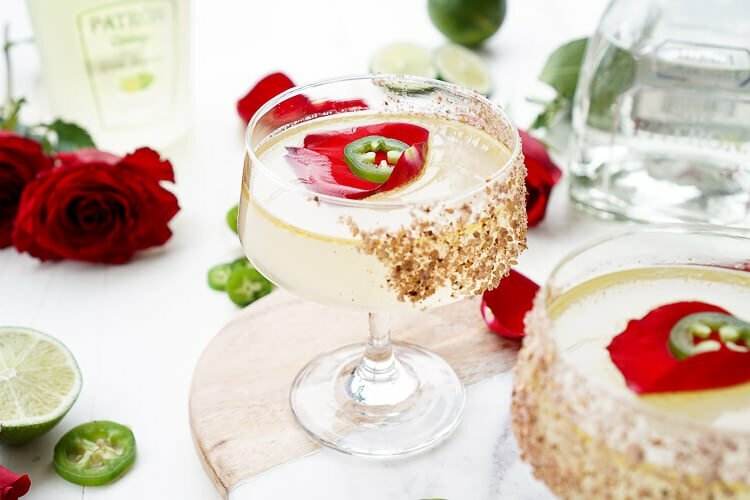 This Spicy Jalapeno Margarita Recipe is the Patrón Margarita of the Year! Expertly crafted, artfully presented, and it tastes as smooth as it looks! There are cocktails, and then there’s craft. Cocktails that are mixed with such precision and grace that they add a little wow factor to your life. 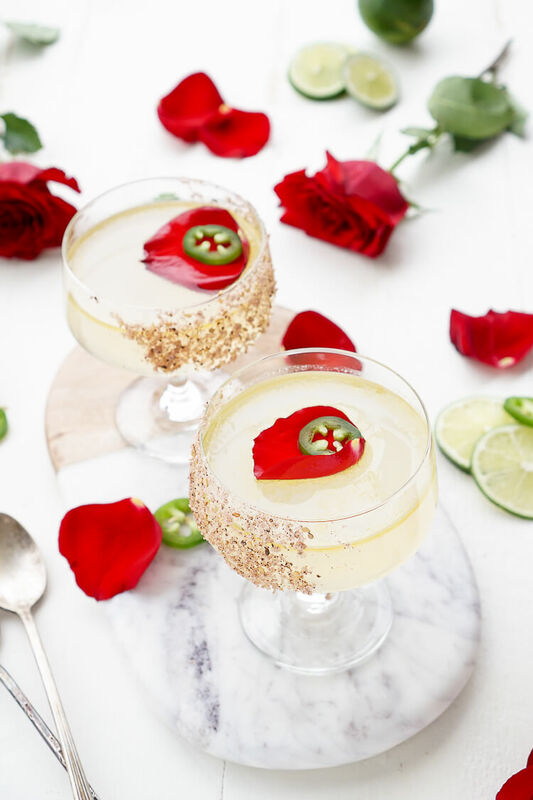 This Spicy Jalapeno Margarita is one such cocktail. PIN IT TO YOUR DRINKS BOARD ON PINTEREST! 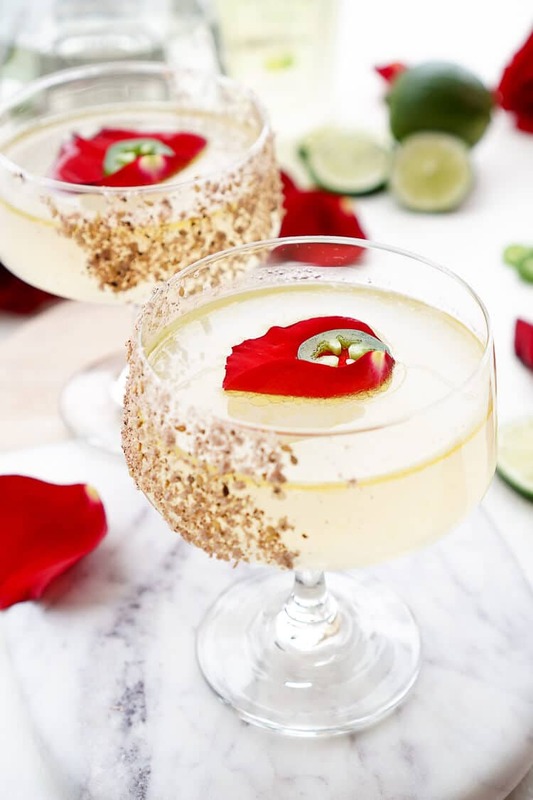 This is a more sophisticated jalapeno margarita that balances heat with fresh floral notes. And in case you couldn’t tell, it’s a bit of a showstopper when it comes to presentation too! I mean seriously, have you seen a prettier margarita? 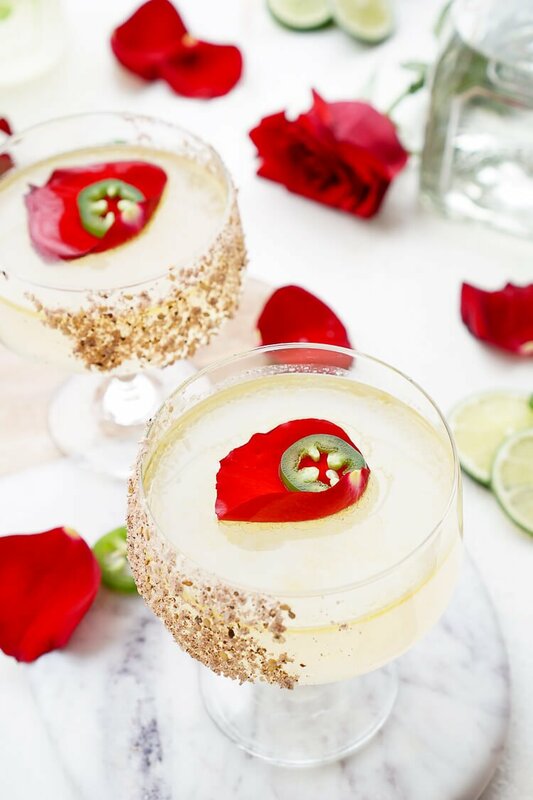 Just imagine serving this up at a wedding as the signature cocktail, or a fancy dinner party as we gear up for Cinco de Mayo! Your guests will be impressed! For us, it was the perfect Sunday evening cocktail. Usually, by the time the end of the weekend rolls around, we need one. Especially on working weekends like we had this past one. I have such an INSANE week ahead of me this week, and after working late yesterday, this was the perfect wind down drink while we watched some TV. Patrón Tequila is so smooth to begin with, and the jalapeño oil removed any indication of a strong alcoholic presence for a super smooth cocktail. The floral notes balanced out the heat, so it wasn’t too extreme, and the lime and ginger blended beautifully for some bright accents. And that rose salt, well that’s just the finishing touch that brings it all together. Like I said before, this spicy jalapeno margarita is a work of art, and every component has been carefully thought out and executed. 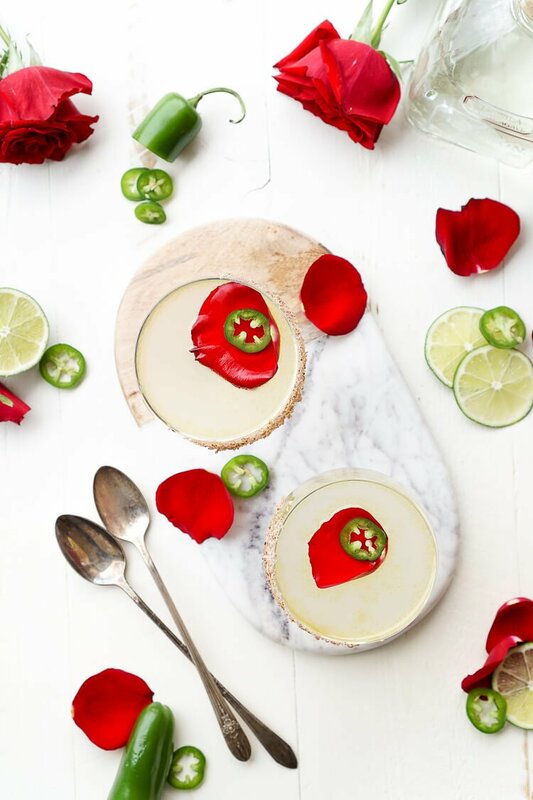 A mix of tequila, lime juice, rosewater, ginger syrup, and jalapeno oil make for a refined spicy cocktail that will knock your socks off! Combine Patrón, Patrón Citrónge Lime, lime juice, ginger syrup, and jalapeño oil in a cocktail shaker with ice and shake to chill. Strain into a chilled cocktail coupe that has been half rimmed with rose sea salt, and top with a dash of rose water. Garnish with rose petal and jalapeño slice if available. This is just so pretty with the rose petal garnish! I know, right! It’s a real stunner of a cocktail! Rebecca, this cocktail looks so tasty! I recently made a paloma flavored with some muddled jalapeno. I love me a spicy cocktail! The addition of rosewater has got me intrigued. I must make this! That sounds delightful! I hope you get a chance to try this one soon! These margaritas really are works of art! I love the idea of salting one side of the glass, instead of all the way around the rim, too (I always preferred being able to take some sips that were salty, and some that were not). Question – how much is a “bar spoon”? Pretty small, I assume, since it is jalapeno oil… That’s not a measurement I’ve encountered before. Hi Anne, that’s the measurements as indicated by the bartender who create the margarita, but a bar spoon is about a teaspoon. I hope that helps! 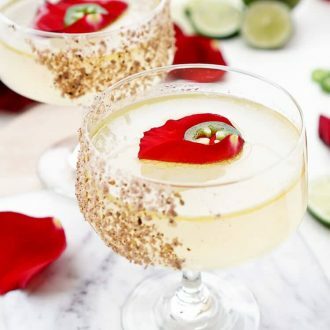 Never thought to use a rose petal as a garnish in a drink, amazing! I hadn’t either before encountering this cocktail! How would one make jalapeno oil? Hi Raquel, if you google how to make jalapeno oil, there are tons of recipes that come up, but I just bought mine. I think muddling the jalapeno would give you a different end result overall, but it might not be a bad one, you could always experiment. … and do you think a similar result could be achieved by muddling jalapeno in the shaker, then straining? The presentation here is absolutely GORGEOUS! I’m suddenly quite thirsty! !